Since I began to write about boxing again, I’ve taken note to appreciate how much has changed and how much has remained the same. The reflection this affords to my own life; the realisation of how much time has lapsed since I was immersed in boxing; attending shows, buying magazines, pay-per-views and inhabiting forums is an uncomfortable one. Representing, as it does, a decade of neglect for my love of the craft of writing and the sport itself; the characters, the light and dark, the sepia past and the high-definition future. The recurrence of names of similar vintage to my own, those who were pertinent that decade ago, and the realisation so many of them are still pursuing purses and chasing dreams provides a touchstone which is both comforting and disturbing in equal measure. On the one hand, it is reassuring to know there are still prizefighters older than me. Perpetuating, as it does, the entirely misguided notion that I remain somehow connected to, or within, my own physical prime. Aside from a sprinkling of grey to my temples, the same as ever I was. Choosing not to challenge this is entirely more conscious and is perhaps a common strategy for deferring the darkness middle-age can impose and the unwelcome awareness of our own mortality. The reality of course, is that I am much depreciated by the ten years between, by the three children, the sponge puddings, the beer, the mortgage payments and the accumulation of retirements from competitive sports. Fighters, as I said recently, are much more like us than we appreciate and as such, can be presumed to share this struggle to accept the passing of birthdays and inevitable diminishing of their capabilities. Worse still, are those fighters who realise too late that the prime they thought elastic or permanent, has gone, and no amount of skipping, dieting or roadwork can bring it back. Occasionally, circumstances present opportunities to dispel the onset of my own middle-age and contest ‘one more time’ with younger, fitter, faster men on a football or cricket field. As a competitive, stubborn and defiant Yorkshireman, a place which instills an unwilting sense of superiority, I accept those invitations, or I did in the corresponding ten years since the first of those retirements. Tomorrow another such invitation is pending, and for the first time, I’m set fair to decline. Fighters who keep on keeping on, like Michael Sprott the 42 year old Heavyweight from Reading, who fights in Hamburg on Friday night a full 21 years on from his debut, are driven by the need to provide. And this is the only way they know how to do it. Like Sprott, Joseph Agbeko, 37, will have his first fight in a year this weekend, when he faces the always gutsy TBA in Accra, Ghana. Further examples appear across many of the numerous cards around the world this weekend; Ricardo Mayorga, 44, will apply a Russian lacquer to his record when he contests the WBA International Super-Middleweight belt. British fight fans will be able to cast their minds back to the pomp of Hatton and Witter when Giuseppe Lauri, 41, rocks up in Lancashire to tackle Denton Vassell. Lauri will be a month short of twenty years as a professional by fight night. Last weekend, Lolenga Mock, 45, fought for the fourth time this year. Fourteen years on from dropping novice pro David Haye. The ambition of these fighters varies but they share one unifying truth, they’re all beyond their respective primes and seeking out a living where once they were headline fighters. If their venerable ages don’t make you reflect on the swiftness with which the sand is slipping to the lower chamber the realisation that Hasim Rahman’s son is now a fighter, Ricky Hatton’s teenage son Campbell won his first title this week, albeit as an Amateur, and yet another Eubank will glove up for the third time, certainly will. My entirely personal swell of regret about lost time and the fear I hold for fighters continuing to accumulate punishment into their second decade as a fighter and their fifth as a human being is what keeps these fighters in my field of vision. With any endeavour, the objective must be to fulfil, entirely, your own potential and in doing so avoid regret. As the saying goes, regret is the heaviest word in the dictionary and it is thought better the regret of something you’ve done, than something you have not. 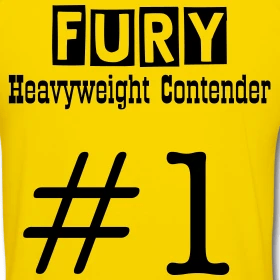 Those sentiments make me delighted to understand Tyson Fury has begun to coordinate the heavyweight show-downs the sport yearns for, because I would hate to witness a 40-something Tyson Fury trying to reclaim youth, relevance and a magic long since lost.